Kyoto; An all-star team of the Japanese women’s professional league, by breaking off their season, took on the amateur National Team for 2 exhibition games in Kyoto on April 21 and won both matches 6-1 and 9-0. Subsequently, Women’s Baseball Association Japan announced to add 6 professional players to 24 amateurs provisional team roasters selected at the tryout in March. The provisional National Team will start joint training session in May to select the final 20 players. The IBAF V Women’s Baseball World Cup will be played from August 10 to 19, 2012 at Telus Field and John Fry Park in Edmonton, Canada. 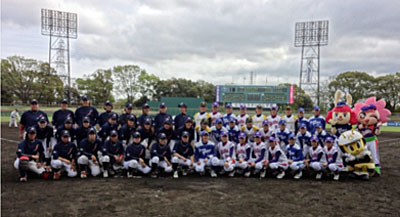 Defending champion Japan, USA, Canada, Australia, Cuba, Venezuela, Chinese Taipei and will participate. The preliminary round in a round-robin format will be played from August 10 to 17 and Japan will squares off with Venezuela following the opening ceremony. The top four teams advance into the semi-finals on August 18. The championship game is scheduled for August 19.